Epiphone’s first Masterbilt archtops quickly rose to popularity during the 1930s “Big Band” era and were renowned for their warm woody tone, wide tonal range and punchy volume. 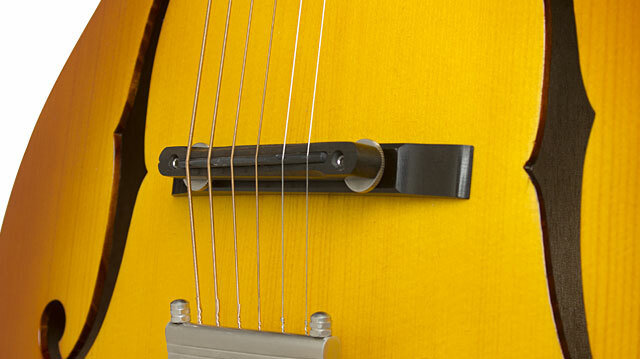 However, with the invention of the electric guitar pickup, archtop acoustic guitars quickly became equipped with magnetic amplification and were for the most part, forever transformed into “electric” guitars. Until now… Epiphone, the leader in affordable professional archtop guitars, reinvents the archtop again by combining our original, time-tested designs with 21st century acoustic guitar electronics to bring you the new Masterbilt Century Collection™. The first collection of archtop “acoustic/electric” guitars designed to be played and amplified as true acoustic instruments. Just play one and you will immediately feel and hear the difference between today’s common “flat top” acoustic guitar and the unique voice of a Masterbilt Century. Plug one in and prepare to be amazed! Really. You have to hear it to believe it. Now with the eSonic™ HD preamp and Shadow NanoFlex™ HD Under-saddle pickup, you can plug in any Masterbilt Century archtop acoustic/electric into an amp or any PA and hear your guitar’s beautiful and dynamic true acoustic tone on any size stage. For flattop guitarists who have only played old plywood archtops, the sound of a Masterbilt Century guitars will be a revelation. 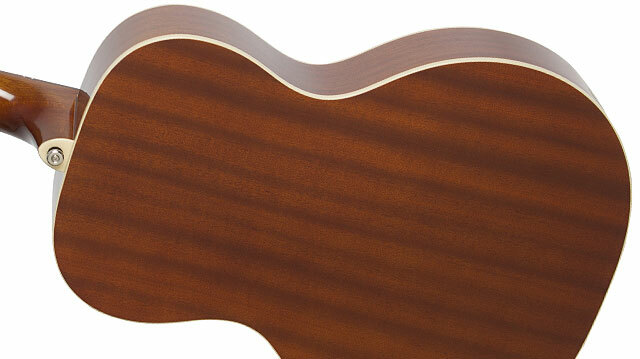 Get ready for a totally new acoustic guitar experience! Body Dimensions Lower Bout = 14.62"
The Masterbilt® Olympic Acoustic/Electric Guitar is a smaller-sized archtop with an arched Solid Spruce top with traditional Longitudinal Bracing, a Mahogany body, and classic f-holes. Inside the upper f-hole is a 1930s era replica Epiphone label. The Olympic is available in traditional Honeyburst and Violin Burst aged gloss finishes, each with unique color tones inspired by Epiphone’s priceless vintage collection in Nashville, Tennessee. The tortoise style pickguard comes unattached. Pickguard hardware comes included. Like Epiphone’s original 30s era Olympic, the new Masterbilt Olympic has a unique body profile that’s smaller than typical archtops but with a tonal range that belies its small size. With its signature f-holes and Solid Spruce top, the Olympic is an ideal instrument for singers and soloists. Both the body and top feature single layer Ivory & Black color binding. The Mahogany neck has a full rounded “C”- profile that is glued to the body with a dovetail joint for a precise fit so the Olympic will resonate as one piece of wood. The fretboard has 20 medium frets, a 25.5” scale length, and pearloid "Dot” inlays modeled after the original Olympics. The compact tone of the Olympic sounds beautiful unamplified on a small stage or in the studio. But now the cutting edge eSonic™ HD (High Definition) preamp system and Shadow NanoFlex™ HD Under-saddle pickup make it possible for archtop players to hear their instrument amplified exactly as they hear it unplugged. No archtop player has ever heard an acoustic guitar more accurately represented through a sound system before. The Shadow NanoFlex HD Under-saddle pickup has easy-to-access controls for Master Volume and Master EQ mounted just inside the lower f-hole. Now you have complete control over how much of the acoustic guitar is amplified. The pre-amp system is powered by a standard 9-volt battery that is easy to access, located near the ¼” output jack. The Olympic comes with Historic Epiphone Re-issue Tuners with Marboloid "Crown" buttons with an upgraded 18:1 tuning ratio for fast and accurate tuning. The tuners are mounted on an Epiphone Dovewing headstock with Pearloid "Banner" logos. 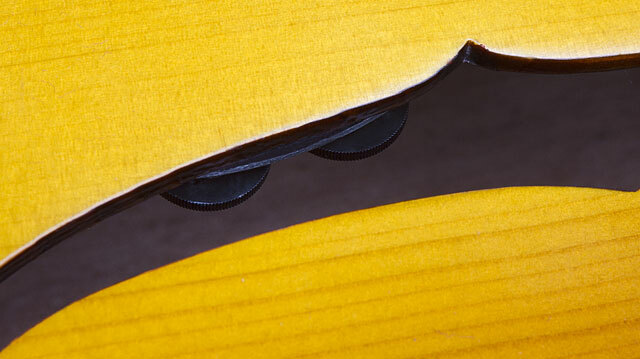 Unlike many vintage archtops, the Olympic has a dual action truss rod for easy and perfect set-up. The Floating Adjustable Ebonoid Bridge is made from a synthesized material that has the grain-like texture and look of Ebony but is harder and more reliable for years of playing. The historic aged all-nickel Trapeze Tailpiece is also inspired from Epiphone’s vintage Masterbilt collection. Every new Masterbilt Century guitar is set up at the factory with Cleartone® 12-53 gauge strings. An optional vintage-styled hard case is also available. The Epiphone Masterbilt® Olympic™ Acoustic/Electric Guitar comes with a limited lifetime guarantee and world renown 24/7/365 Gibson Customer Service. Discover a new world of acoustic sound and style with the Epiphone Masterbilt® Olympic™ Acoustic/Electric Guitar and try out all the Masterbilt Century Collection instruments at your nearest Authorized Epiphone Dealer. The Olympic Masterbilt Century Hard Case fits the smaller-sized Olympic archtop acoustic/electric guitar in a beautiful Russet Brown-colored case modeled to look like the original leather-covered Masterbilt cases from the 1930s. The top of the case is arched with "Masterbilt Century" in Gold Art Deco-inspired typeface for a perfect fit when closed. The 4 latches and hardware have the look of aged brass and the padded handle has the feel of vintage leather. The soft Burgundy interior has the classic “E” embossed on the lid and the accessory compartment has a leather pull. 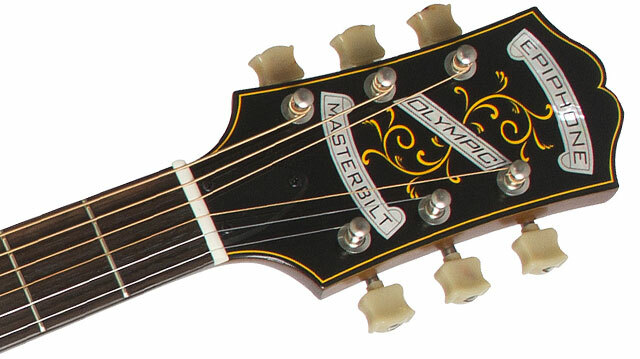 The Olympic Masterbilt Century Hard Case is made to last, just like your Olympic!